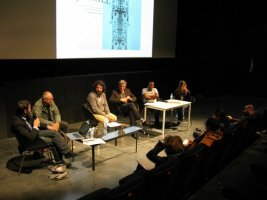 Title: "Activities and Vocabulary, discussing and sharing art projects at large"
Participants: Researchers, curators and artists (audience by subscription only). The discourse that has been cultivated over the past few years is increasingly emptied of its object. In article after article and exhibition after exhibition, the rift deepens between art and the commentary that tries to explain it. Artists and those who speak about artworks or organize exhibitions must understand the goal of each work and its intent in order to better translate its ideas into exchanges. This must happen as much in discourse as in the basic, day-to-day narratives that structure communication around art. This seminar proposes a first site for constructing a coherent vocabulary for the translation of original artistic projects. This will be a terminology that permits us to renew the discourse, to go beyond the conventions now used in the art market or in the communication of art frequently too attached to the periods and concepts of Modern and Contemporary Art. The first sessions will be an opportunity to listen to proposals for such a terminology by art critics, artists, curators, and researchers and to discuss possibilities for trans-disciplinary translations. The seminar takes place in the Laboratory “Art, Technology and Ecology” at ESAV-Marrakech and L’appartement 22, with a public program on November 24th. 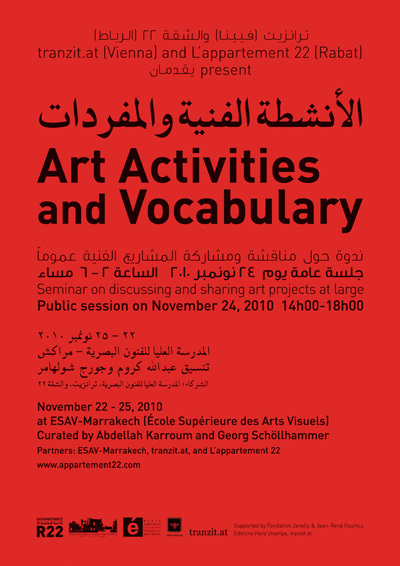 Ecole Supérieure des Arts Visuels (ESAV-Marrakech), Domaine Universitaire (Daoudiate), Marrakech.